The Charlottesville Area is a historic, scenic, and sought-after place to live. Information below will give you and overview of our town and links to even more information that will help you decide if Charlottesville should be YOUR home. You may also view popular neighborhoods in the area from the AREA dropdown menu. Tourism plays an important role in the City’s economy, much of it based on its rich historical legacy. Two million travelers visit the area each year to see the area’s historic sites and the spectacular scenery of Central Virginia. Monticello, the home of Thomas Jefferson, sits on a nearby mountain overlooking the city and offers tours and special events and ceremonies. Ash Lawn-Highland, home of James Monroe, features beautiful gardens and furnishings reflecting the Federal style is just a mile down the road from Monticello. Montpelier, the home of James and Dolly Madison, recently reopened to the public for tours, tastings, and horseracing. concerts from Spring to Fall featuring nationally known musical talent. The Paramount is a renovated historic theater that brings in comedy acts, musical theater, and some of the country’s best singers. Live Arts is a community theater providing full season productions, several special series, and extensive education programs. Blue Ridge Mountains The Blue Ridge Mountains, meandering 469 miles from Shenandoah National Park in the northern Shenandoah Valley of Virginia to the Great Smoky Mountains National Park in North Carolina, follows the Appalachian Mountains and boasts some of the most spectacular scenery in the world. A hundred species of trees, a variety of flowering shrubs and wildflowers as well 54 different mammals and 59 species of birds live along the Parkway – more than the entire European continent! Skyline Drive connects to the northernmost section of the Blue Ridge Parkway, winding along the crest of the mountains from Waynesboro northward 105 miles to Front Royal. 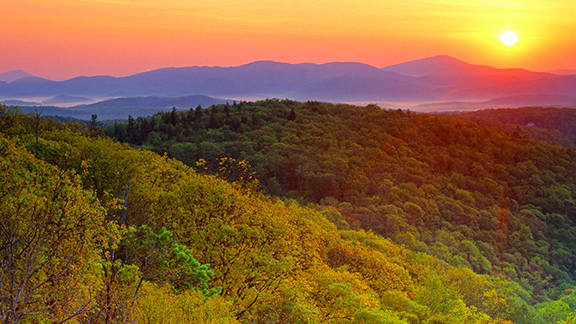 For more information about the Blue Ridge Mountains in Virginia or activities they offer, click here. Culture and Entertainment The City offers an impressive variety of cultural, social, and recreational opportunities. There are 26 neighborhood and jointly funded parks and an and an extensive series of walking trails that run through parkland, residential areas, and along the beautiful Rivanna River. For more information, please refer to the Parks and Recreation website. There is also a thriving art, music and theater community that keeps the creative spirit alive in Charlottesville. A recently opened 4,000 seat Charlottesville Pavilion amphitheater draws big named acts into the downtown area and hosts a weekly Friday After Five concert in the spring through the fall, a local favorite to kick off the weekend. The downtown pedestrian mall is one of the most successful of its kind in the country and boasts over 150 shops and award-winning restaurants. A magnet for art, music, dining, shopping and entertainment, the mall is now home to a newly renovated Paramount Theater, one of few community-supported restorations of historic extensive theaters in the country. The 1,200 seat theater has hosted nationally-known entertainers. The 16,000 seat John Paul Jones Arena (JPJ) opened in 2006 and has already hosted national caliber events such as The Dave Matthews Band, Rod Stewart, Billy Joel, Elton John, Eric Clapton, Jimmy Buffet, The Police and Cirque du Soleil. JPJ was recently voted as the Best New Entertainment Venue in the Country. Other popular activities in the area include world-class tennis, golf, hiking, ballooning, horseback riding and racing, tubing, fishing, biking, camping, and the occasional hunting for antiques. Wineries The area also boasts a thriving wine touring and tasting business. The nearly 30 local vineyards make up the state’s largest collection with several wineries winning national recognition.The natural beauty of the Blue Ridge Mountains and charm of historic Charlottesville lure thousands of tourists to the Monticello area wineries. Since there are twenty-one wineries in the Monticello appellation, we have created four Wine Trails. Each Wine Trail links up to group of wineries for a fun weekend or day trip. 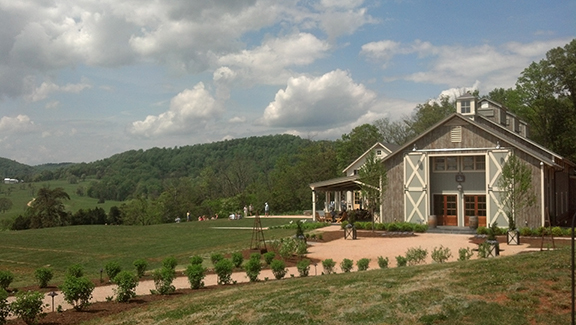 For a map of wineries in the Charlottesville Area, click here. Businesses Charlottesville has been named one of the country’s TOP FIVE CITIES FOR RETIREES by Kiplinger.com, a publisher of business forecasts and personal finance advice from Washington, D.C. The decision was made based on many influential factors such as state tax rates, exemptions for various retirement incomes, low crime rates, access to airports, local transportation and access to leisure activities.Men’s Journal magazine recently listed the City of Charlottesville as ONE OF THE HEALTHIEST CITIES TO LIVE IN THE COUNTRY. The new accounting used information compiled by Sperling’s Ranked and Rated in their Best Places to Live survey to give editors a snapshot of long term health conditions. The national magazine looked at quality of life issues that contribute to a healthier lifestyle including: availability of local farms and products, shorter commute times, sidewalk access and pedestrian friendly community, lower pollution levels, available and expanding green spaces, and mild climate and sunny days.The Milken Institute’s BEST-PERFORMING CITIES OF 2009 index ranked Charlottesville at 26th in the nation of the 124 smallest metropolitan areas. The index ranks U.S. metropolitan areas by how well they are creating and sustaining jobs and economic growth. The components include job, wage and salary, and technology growth. The study looks at several categories of short and long-term job, wage and high tech company growth in each region and compares them to the national average. It uses data from Moody’s Economy.com, the Census, and the Bureau of Economic Analysis. Charlottesville received the highest ranking of all Virginia small metros. The City’s downtown has shown dramatic changes during the past decade and in particular during the past five years, as a result of both on-going public and private investment in new construction and renovation/restoration projects. 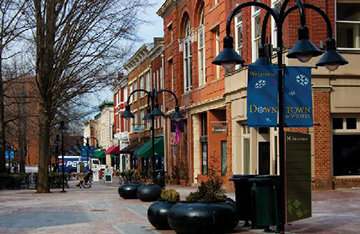 The City’s Downtown Pedestrian Mall is thriving, with an exciting combination of residential and retail units, restaurants, a movie complex, an ice skating rink, hotels, the renovated Paramount Theater, and the new Charlottesville Pavilion, as well as a number of office complexes and financial institutions, all of which draw both local residents and tourists to the area.A major refurbishment project was completed in 2009 on the City’s 34-year old Downtown Pedestrian Mall. The multi-million dollar public project included upgrading utility work, adding wireless connectivity for mall merchants and cafes, improved streetscape amenities and lighting as well as installation of over 350,000 new bricks and granite accents throughout the length of the eight-block promenade. The completion of this significant project will help ensure the vitality of this popular destination for decades to come. 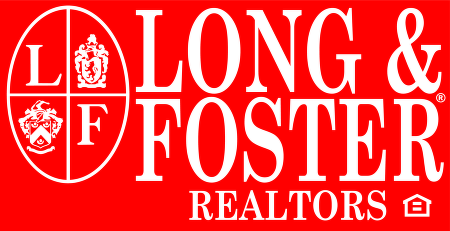 Please click HERE for a list of Local Resources.